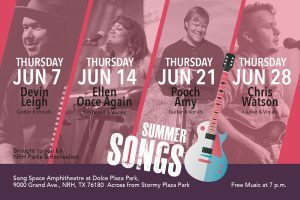 Celebrate NRH’s newest park with Summer Songs at the Song Space Amphitheater, 9000 Grand Avenue, across from Stormy Plaza Park, in front of the Dolce Living Main Building. Bring your lawn chairs and favorite beverage and come enjoy free, outdoor and informal live music performances at 7 p.m. on Thursdays in June. Relax and enjoy a 45 minute informal music set by some of the area’s best musicians! I’ll be playing on June 14th, If you’re in the area, please come tap your toes and say hello!